Our company, TreePans Inc. was recognized in the April issue of Bullseye for its recent awards and accomplishments. 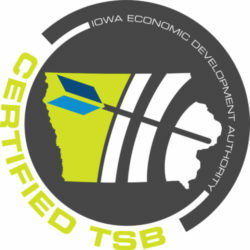 Bullseye, is a monthly [electronic] newsletter, which showcases targeted small businesses throughout the state of Iowa. First, we would like to say how grateful we are for both awards and those who nominated us for each. Second place at Surge Summit alumni pitch. Both awards were based on notable accomplishments in the previous calendar year, which we have highlighted some below. From expanding markets, to product developments, our team has worked hard to continue its positive growth. First, company received its official United States and Canadian utility patents. Savanah Tree Foundation and other notable non-profits. Finally, we have increased our sales presence internationally . Thanks to great work by Russell Horsey of TreePans, the international forestry company Sorbus, will now carry and sell TreePans. We and our clients hold great value in our small, family owned business. Our commitment to our customers is what continues to bring us great opportunities across the world. For that reason, we will begin to showcase some of those great relationships in our Partner Spotlight.